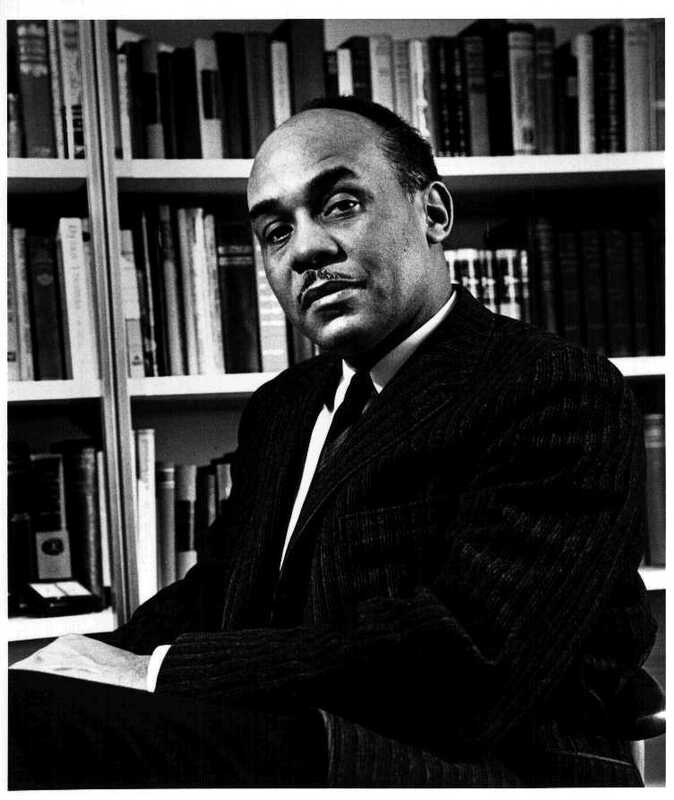 The Oklahoma-born African-American novelist and scholar Ralph Waldo Ellison (1914-1994) is most famous for his 1952 novel Invisible Man (not to be confused with H. G. Wells’ 1897 science fiction novella “The” Invisible Man), which is considered a milestone of American literature. After studying music at Tuskegee Institute in Alabama (founded by the African-American educator Booker T. Washington in 1881), Ellison moved to New York City in the 1930s in hope of learning sculpture and photography. There, after befriending the African-American Richard Wright, one of the first writers to protest white treatment of blacks, Ellison began contributing stories, reviews and essays to various periodicals. After serving in World War II, he started working on his masterpiece. Ellison remained active in academia as an authority on black culture until his death. In Invisible Man, Ellison, who was strongly influenced by Fyodor Dostoevsky’s Notes from Underground and T.S. Eliot’s The Waste Land, narrates the existential angst of a nameless black protagonist in hauntingly poetic, perfectly measured prose. The youth, an impassioned orator, who hails from the American South, wins a scholarship to a prestigious black college from which he is soon expelled. After a petty job and much humiliation in New York City, he becomes the chief spokesman of the Harlem branch of “the Brotherhood” – a political organisation that supposedly works for the socially oppressed. Soon though, unable to get along with whites and blacks amid confusion and chaos, he retreats into a basement lair, where he begins reflecting on his individuality. The book is a bildungsroman (a story of character formation) and a lot more. Ellison’s stylistic mapping of the black identity mingled with a exposure of the hypocrisies and stereotypes of early twentieth century America won him the National Book Award in 1953. In 1998, the Modern Library ranked Invisible Man as nineteenth in a list of the best 100 English-language novels of the twentieth century. In 2005, Time magazine included it in a list of the 100 best English-language novels written between 1923 and 2005. Invisible Man is “one of those rare novels whose commercial and critical success coincide in a continually accelerating, rising curve” [John F. Callahan in Ralph Ellison’s Invisible Man: A Casebook (2004)]. I am an invisible man. No, I am not a spook like those who haunted Edgar Allan Poe; nor am I one of your Hollywood-movie ectoplasms. I am a man of substance, of flesh and bone, fiber and liquids – I might even be said to possess a mind. I am invisible, understand, simply because people refuse to see me. Like the bodiless heads you see sometimes in circus sideshows, it is as though I have been surrounded by mirrors of hard, distorting glass. When they approach me, they see only my surroundings, themselves, or figments of their imagination – indeed, everything and anything except me.